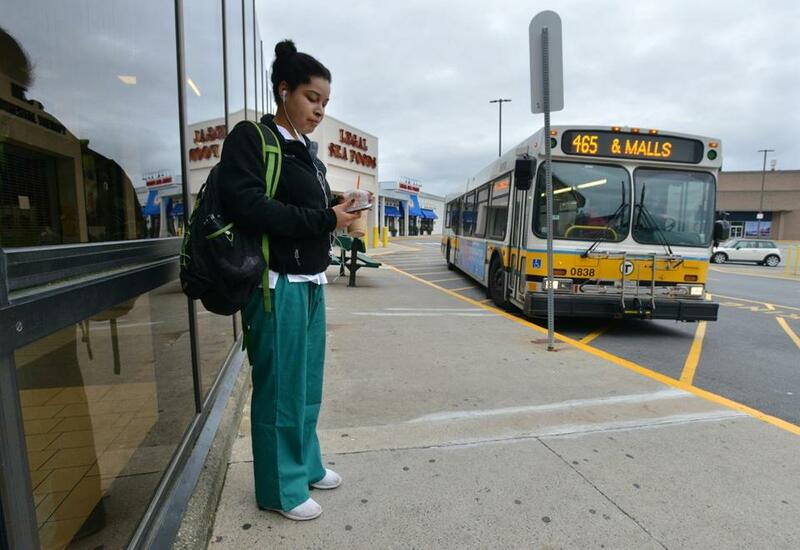 Dania Matos awaited her Uber ride to class after taking an MBTA bus to the North Shore Mall. PEABODY — It was just past 7:30 a.m. when Dania Matos stepped off the 465 bus at the North Shore Mall. She had gone as far as public transportation would take her, but her classes at North Shore Community College were still 5 miles away. Within minutes, the 22-year-old nursing student was on her way in the back of an Uber car, which dropped her off at the Health Professions building. She paid with her credit card, but it was the college that picked up most of the tab. As classes began last month, North Shore Community College launched a partnership with Uber — one of the first times a college has teamed up with the ride-hailing company in such a way. For every ride a student takes to the Danvers campus from nearby transit hubs, the public two-year school pays $10, making it easier for its 7,000 students to attend classes without driving. “If you don’t have a car, it gets nearly impossible to get there,” said Matos. The partnership — expected to cost the school $40,000 this year — comes as Uber, the country’s leading ride-for-hire firm, continues its rapid expansion, increasingly forging partnerships with towns, transit agencies, and institutions to supplement public transportation. Boston says it will not have to change its regulations for taxis to include ride-hailing firms such as Uber. MBTA has struck a deal to subsidize Uber rides for thousands of people with disabilities. Dallas, Atlanta, and other communities have also struck various partnerships encouraging Uber to ferry riders from public transit stops, bridging what transit specialists describe as the “first and last mile” gap. Lyft, Uber’s chief competitor, has also marketed itself as a way to reach bus or subway stations. It is a welcome development for students like Matos. She said that before she learned about North Shore Community College’s partnership, she thought she might have to skip classes to reduce her commuting costs. 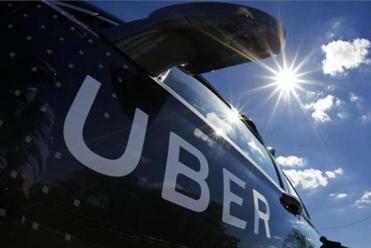 Peter Furth, an engineering professor with the Dukakis Center for Urban and Regional Policy at Northeastern University, said it’s likely that Uber will stake out a growing presence in suburban areas without much public transportation. But some expressed concern about public institutions providing subsidies for a private company, and said the partnership, while innovative, should ideally not be necessary. When Patricia A. Gentile became president of North Shore Community College two years ago, she could see from her office window a steady flow of cars dropping off students. When she heard students couldn’t reach campus by public transit, she could hardly believe it. A MBTA bus could get students as close as the mall, but no closer. “You can get to the mall to go shopping, but you can’t go to college?” Gentile said. The MBTA used to run a bus route to the college, but shut it down in 2002 because of low ridership, an agency spokesman said. Gentile said she knows that some students still find it difficult to get to campus and that the lack of public transportation could discourage prospective students. The college runs a shuttle bus to its other campuses in Lynn, Danvers, and Middleton, but it shows up only every two hours or so, which discourages students from taking it. Many students can’t afford a car, and Gentile spoke with one student who told her he walked nearly 4 miles a day to class, cutting through the field of a nearby technical high school. Others, like Matos, say they have to rely on friends and family for rides. Gentile said she asked the MBTA if it could resume a bus line, but was told the college would have to provide evidence that students would use it. That’s when she reached out to Uber. Uber has come under criticism for not conducting more rigorous background checks of its drivers after a number were accused of sexually assaulting passengers. Gentile said administrators believe such incidents won’t be as much of an issue because students can take the rides only during class hours. Massachusetts also recently passed a law that requires the state to conduct background checks for Uber drivers, although the provision has not taken effect. College officials said the partnership is in place for a school year, and hope strong demand for the Uber service could persuade the MBTA to bring back bus service. Over the first three weeks, Uber provided just 60 rides, but administrators believe more students will take advantage of the service as word spreads. Matos said she’d be happy with a bus, but is thankful she has a way to get to school.